For a European system of rescue at sea! With a public appeal PRO ASYL urges the European Parliament to establish an European system of rescue at sea and to open up legal and non-dangerous routes to Europe. “We can­not allow more peop­le to die. Lam­pe­du­sa must be a tur­ning point for European refu­gee poli­cy.” The­se were the words of the Pre­si­dent of the European Par­li­a­ment, Mar­tin Schulz, after the 366 refu­gees lost their lives off Lam­pe­du­sa on 3 Octo­ber 2013. But today – one year later – the­re is still no safe ent­ry for tho­se see­king pro­tec­tion. Our public appeal urges Mar­tin Schulz as Rep­re­sen­ta­ti­ve of The European Par­li­a­ment: The EU must stop peop­le dying at its exter­nal bor­ders and open up legal, non-dan­ge­rous rou­tes for refu­gees. A European sea res­cue ser­vice needs to be estab­lished. The European Par­li­a­ment must imme­dia­te­ly allo­ca­te the requi­red finan­ci­al resour­ces. “We can­not allow more peop­le to die. Lam­pe­du­sa must be a tur­ning point for European refu­gee poli­cy.” The­se were your words after the 366 refu­gees lost their lives off Lam­pe­du­sa on 3 Octo­ber 2013. But today – one year later – the­re is still no safe ent­ry for tho­se see­king pro­tec­tion. The EU must stop peop­le dying at its exter­nal bor­ders and open up legal, non-dan­ge­rous rou­tes for refu­gees. A European sea res­cue ser­vice needs to be estab­lished. The European Par­li­a­ment must imme­dia­te­ly allo­ca­te the requi­red finan­ci­al resour­ces. Plea­se take up this cau­se with the aim of achie­ving pro­tec­tion for refu­gees at the exter­nal bor­ders of the European Uni­on. The ope­ra­ti­on Mare Nostrum has to be con­ti­nued. In view of the approx. 3000 deaths sin­ce Janu­a­ry 2014, an ope­ra­ti­on under EU lea­dership must not just replace the pre­sent ope­ra­ti­on of the Ita­li­an navy, it must be expan­ded to avo­id fur­ther deaths. Euro­pe has pro­po­sed a Fron­tex ope­ra­ti­on cal­led Tri­ton but it can­not per­form this cen­tral task. Even Fron­tex does not tire of empha­sising that the focus of its ope­ra­ti­ons is bor­der con­trols, not res­cue at sea. The Fron­tex sta­tis­tics for irre­gu­lar bor­der crossing in 2013 show a clear trend towards the dan­ge­rous sea rou­te. More than half of all per­sons picked up (107,385) were fle­eing over the seas. Accord­ing to Fron­tex 40,304 boat refu­gees were res­cued in the cen­tral Medi­ter­ra­ne­an alo­ne, and in the Aege­an just under 11,000. Over 15,000 Syri­an refu­gees used the­se two dan­ge­rous rou­tes last year – in 2012 it was only about 1500. The num­ber of Syri­an boat refu­gees has increa­sed ten­fold in a very short time and this trend is con­ti­nuing in 2014 in dra­ma­tic fashion. In Ita­ly alo­ne about 15,000 Syri­an boat peop­le had arri­ve by the end of July, while the over­all num­ber of refu­gees com­ing ashore at this time was about 85,000. By the end of August a total of over 108,000 refu­gees had taken the dan­ge­rous sea rout to Ita­ly. Mean­while the num­ber of deaths has risen to about 3000, with each week see­ing new dra­ma­tic dis­as­ters hap­pe­ning due to unsea­wor­thy boats. Through the Ita­li­an ope­ra­ti­on Mare Nostrum over 110,000 refu­gees have alrea­dy been res­cued in the cen­tral Medi­ter­ra­ne­an. Now the Ita­li­an government intends to ter­mi­na­te the sea res­cue ope­ra­ti­on in Octo­ber of this year. In the sum­mer, the European governments had still refu­sed to allo­ca­te make funds to turn Mare Nostrum into a European sea res­cue ope­ra­ti­on. About EUR 9 mil­li­on per month was too much for the European governments to save tens of thousands of human lives. 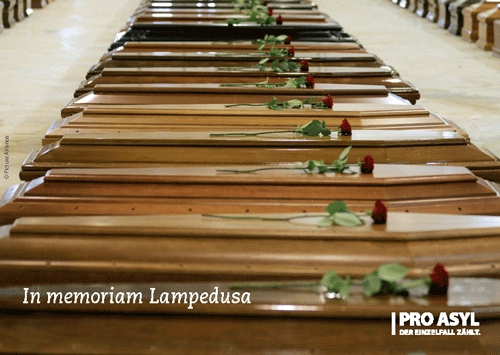 In spi­te of the res­cue ope­ra­ti­ons of Mare Nostrum over 2500 boat refu­gees have lost their lives in the last four mon­ths alo­ne – a down­si­zing of the ope­ra­ti­on would have had dra­ma­tic con­se­quen­ces: even more deaths would be the fore­see­ab­le con­se­quence. Now a Fron­tex ope­ra­ti­on is to be deploy­ed. European Com­mis­sio­ner for Home Affairs Ceci­lia Malm­ström pro­mi­sed this to Ita­li­an inte­rior minis­ter Ange­li­no Alfa­no on 27 August. The pre­sent­ly dis­cus­sed plans allow us to fear the worst: ins­tead of more sea res­cues it looks like a Mare Nostrum light – with a strong focus on bor­der con­trols and pro­tec­tion. Fron­tex its­elf admits that it will not be pos­si­ble for it to “replace” Mare Nostrum. The finan­cing of Ope­ra­ti­on Tri­ton, some­ti­mes even cal­led Fron­tex Plus, will be clear­ly below the funds spent on the Ita­li­an ope­ra­ti­on – accord­ing to Fron­tex the costs will be about EUR 2.8 mil­li­on per month. The deploy­ment area is also to be redu­ced. While Mare Nostrum under­took res­cue actions in Liby­an coas­tal waters, Tri­ton is only to cover the pre­vious area of Her­mes and Aenea – i.e. the Ita­li­an coas­tal waters. Fron­tex inte­rim direc­tor Gil Ari­as con­fir­med at his pre­sen­ta­ti­on of the new ope­ra­ti­on to the European Par­li­a­ment on 4 Sep­tem­ber 2014: “Neit­her the mis­si­on, nor the resour­ces per­mit a repla­ce­ment”. The­re is a “fun­da­men­tal dif­fe­rence”, he said, bet­ween Tri­ton and Mare Nostrum. While the lat­ter was a “seek and res­cue ope­ra­ti­on”, Tri­ton would focus on “bor­der con­trols”. Ceci­lia Malm­ström like­wi­se con­fir­med on 3 Sep­tem­ber 2014, that Fron­tex Plus could not replace Mare Nostrum. The­se opi­ni­ons lea­ve no doubt that with Fron­tex Plus (or Tri­ton, a Joint Ope­ra­ti­on) the death toll will con­ti­nue to rise. Only a Europea­ni­sa­ti­on of sea res­cue can pre­vent this hap­pe­ning – and Fron­tex is not a sea res­cue agen­cy! Hence the urgen­cy of estab­li­shing a civil European sea res­cue ser­vice. The European Par­li­a­ment super­vi­ses the EU bud­get and can thus imme­dia­te­ly allo­ca­te the necessa­ry resour­ces to set up a European sea res­cue ser­vice. Until this plan is imple­men­ted, Mare Nostrum must be con­ti­nued, streng­t­he­ned and, above all, ful­ly finan­ced by the European Uni­on and its mem­ber sta­tes. The Medi­ter­ra­ne­an is not only our com­mon sea – action to res­cue boat refu­gees is a com­mon European respon­si­bi­li­ty. An intra-European soli­da­ri­ty mecha­nism is necessa­ry to flank a com­pre­hen­si­ve sea res­cue ope­ra­ti­on. Refu­gees who arri­ve e.g. in Ita­ly, Mal­ta or Greece, must get the oppor­tu­ni­ty to tra­vel on to ano­t­her EU mem­ber sta­te. This must be made pos­si­ble par­ti­cu­lar­ly in cases in which the­re are fami­ly con­nec­tions or com­mu­ni­ty net­works in cer­tain coun­tries. It would be an act of huma­ni­ty but also a con­tri­bu­ti­on to more soli­da­ri­ty bet­ween EU mem­ber sta­tes. We are great­ly con­cer­ned about the initia­ti­ve by the inte­rior minis­ters from Ger­ma­ny, Fran­ce, the UK, Spain and Poland, who wro­te to Ceci­lia Malm­ström, still ser­ving as com­mis­sio­ner for home affairs, on 9 Sep­tem­ber 2014. In their let­ter they out­line how they see the solu­ti­on “of the migra­ti­on pro­blem in the Medi­ter­ra­ne­an”. One prio­ri­ty would be action for bet­ter super­vi­si­on of the exter­nal bor­ders and migra­ti­on flows into the EU, they wro­te, also a stron­ger effort to thwart gangs of peop­le smugg­lers and stron­ger coope­ra­ti­on by the EU and the tran­sit sta­tes and coun­tries of ori­gin affec­ted by the migra­ti­on issue. Ins­tead of reques­ting impro­ved sea res­cue and the crea­ti­on of legal ways for refu­gees to reach Euro­pe, they focus on more effi­ci­ent pro­tec­tion of the bor­ders. Thousands of refu­gees from Syria, Eri­trea and Soma­lia strand in Libya, whe­re they are expo­sed to serious human rights vio­la­ti­ons – the only opti­on remai­ning to them is the peri­lous and regu­lar­ly fatal voya­ge across the Medi­ter­ra­ne­an. Refu­gees in Liby­an tran­sit should be rapidly evacua­ted and recei­ve pro­tec­tion in Euro­pe. Over 3 mil­li­on Syri­an refu­gees have fled their coun­try by now. Many of them have fami­ly mem­bers who alrea­dy live in European coun­tries. In view of the suf­fe­ring of refu­gees at the gates of Euro­pe, the European Uni­on is obli­ged to take coor­di­na­ted action to recei­ve per­sons see­king pro­tec­tion (with the aid of huma­ni­ta­ri­an recep­ti­on pro­gram­mes or resett­le­ment). Fur­ther­mo­re, the European Uni­on must gua­ran­tee that the­re are no more push-backs at its land and sea bor­ders: such refou­le­ment is an infrin­ge­ment of inter­na­tio­nal law. Lam­pe­du­sa must intro­du­ce a chan­ge of cour­se in European refu­gee poli­cy! Mare Nostrum must be Europea­nis­ed and expan­ded. In order to pre­vent refu­gees taking to the­se boats at the risk of their lives, Euro­pe must open safer rou­tes for refu­gees.